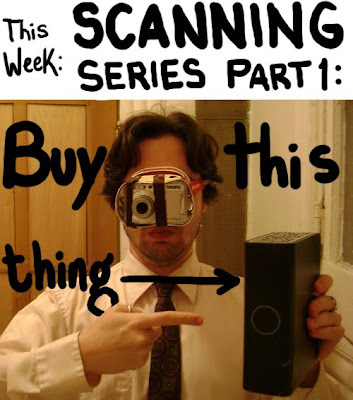 Scanning Series Part 1: Get an external hard drive. No, really, if you don't have one, go get one right now. Don't even think of reading next week's entry or any of the rest in the series until you've gotten one. You'll thank me later, believe me. I have friends who got their external hard drive days before a catastrophic computer failure that would have lost years of work they would have had no way of getting back. I also have friends who lost months of work forever because they didn't have one, or didn't use it. If you can afford it, buy 2, or use a web-based service on top of the external. External hard drives corrupt and fail too. If you don't have a way to protect your files, you have no business scanning them. Go. I'd better not see you back here until you have one. Oh, and check out this nifty little suitcase I bought on the street to hold my originals while traveling! Isn't it just darling? I have some travel announcements forthcoming about my speaking at SCAD's Atlanta campus in late October. My first Comic Tools speaking gig! Woo! Congrats on the lecture gig! EEE the suitcase is just ADORABLE and it's so you with your tweed jacket and hat.! I wish I had a tweed jacket and hat! And thank you. Why not just burn to CD or DVD? Cheaper & much more portable & easily storable. 8.4 GB x 25 = 210 GB per ~$30. That's ~14 cents per GB. 1,000GB (1TB) for ~$80 these days. That's 8 cents a GB. So, it's almost twice as much money to store on blank DVDr media. External drives are getting smaller and smaller space wise, and you can just plug and go, drag and drop, no need to worry about burning software, blah blah blah. What a great post! Seamlessly extolling the virtues of old school and new school storage! Modern suitcases just get uglier and uglier, but someday there will be portable external hard drives that look just like your groovy little valise. Blake made much of my point for me, and actually worked out the price in a way I'd have been too lazy to. I'd like to add to what he said, that when you have an external drive you can have a desktop just like your computer desk top, so when you're in there you know where everything is. You talk about CDs being easier to store, but I'm not convinced that having to sift through dozens of CDs looking for the files I want, putting them in, dragging the file onto my desktop, modifying it, and then burning another CD is easier than having a single hard drive that's a mirror image of the one on my computer. You can synch files, rearrange things endlessly, and keep much more than just your files- to make a Star Trek reference, my external drive basically has my computer's Katra in it. I have all my preferences, every piece of software I've ever downloaded (including my whole adobe suite), everything, saved in the hard drive exactly as it is in my computer. My computer goes? I get a new one, drag and drop, tweak a few things and it's like nothing happened. Plus, my external drive is a little old. They make ones with more memory than mine thinner, stronger and cheaper bow. The CD case needed to hold just the files for my First Second book alone would be as large. Greg: I hadn't thought of that! What a lovely connection to make! Oh, I'm so jealous of those kids that you are speaking at SCAD, my alma mater. I never did go to the Atlanta campus (it was very new when I graduated), but I am sure you will love all the SCAD folks!